A brass thimble found in a tin of buttons on a table in the forge. The number 2 is stamped near the base. I gifted the thimble to a friend in 2006. It now resides in Bhaltos, a small village on the Isle of Lewis, Scotland. I enquired about it yesterday and was met with the response “I do still have it of course! It’s in my sewing box alongside all my other womanly accoutrements!” and this morning I received the photograph below. 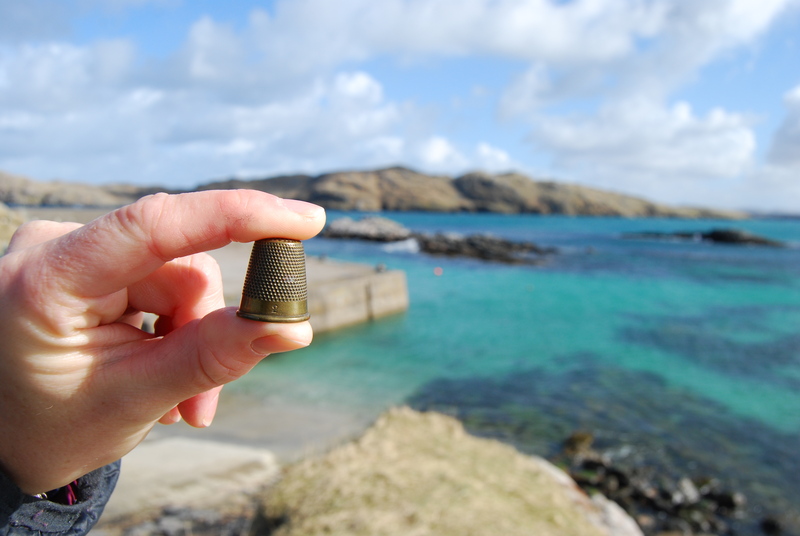 BFK004: Brass thimble gifted to a friend in 2006, currently residing in Bhaltos, Isle of Lewis, Scotland (Digital Photograph: Ep, 11/04/15).